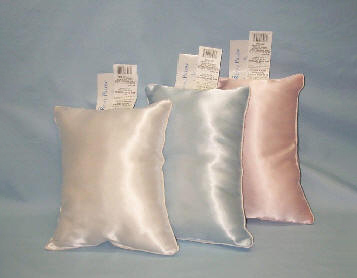 We offer inserts for decorative pillows, filled with both POLYESTER and DOWN /FEATHERS. We list only the most “popular” sizes, including some RECTANGLES / CIRCLES / BOLSTERS, call us for your particular needs. We also specialize in CUSTOM SOLIDS or ENVELOPE style with band borders and channels, for sofa seats and backs. Professional Decorators and Workrooms, as well as Arts and Craft Hobbyist can now buy all their inserts direct from us at wholesale. Whether is a standard or custom size, simple knife edge or with an outer band and channels, just call us with your measurements. 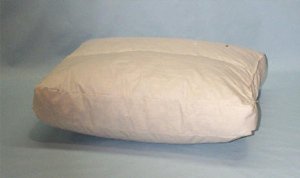 SOFT: It’s a soft, resilient, bouncy, slick polyester, that holds out very well for throw pillow inserts. DOWN-LIKE: Also call “GEL fiber” is very soft, but has NO BOUNCE. When these inserts are “karate chopped” they stay chopped, they don’t bounce back to their original shape, similar to down and feather inserts. Try our version of down-like if you are looking for that down/feather feel. DURASOFF: Conjugated-slick polyester fiber, a step up from our SOFT; extremely soft, very bouncy, light, and very resilient. General Comments: Our polyester inserts are well filled and covered with a non-woven evolution synthetic durable outer cover. They are also available with a fabric cover. We strongly recommend buying an insert 2″ bigger than the cover , so that the corners will be well filled. They are available in most sizes, and shapes (round, neck rolls, hearts, and rectangles). Unfortunately, due to limited space on the web site, we list only our most popular sizes. If you need anything else e-mail us (contact us) or call 305-634-3415 (9am to 4pm est.). 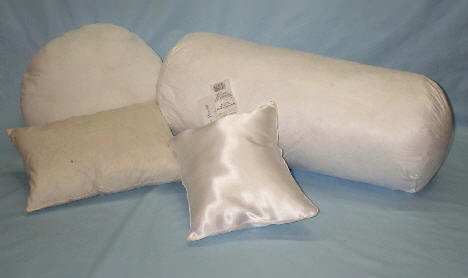 100% White Goose Down 600+ – These are 100% White Goose down pillows (minimum 600+ fill power), NO feather stems. The cover is a 200 thread count, white down proof ticking. Well filled. 50% Down / 50% Feathers – This blend also uses the smaller feathers and an even a higher percentage of pure down than our 30%/70% blend. The cover is a 200 thread count, white down proof ticking. Well filled. 30% Down / 70% Feathers – These pillows are filled with 30% down and 70% feathers, we use smaller feathers than the 10%/90%blend, and a higher percentage of pure down, giving the pillows a smoother feel. The cover is a 200 thread count, white down proof ticking. Well filled. 10% Down / 90% Feathers – This is our entry level down/feather pillows, filled with 10% down and 90% feathers. The cover is a 200 thread count, white down proof ticking. 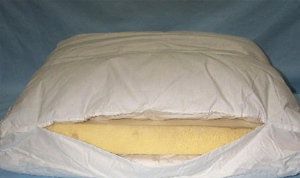 General Comments: Our Down and Feather inserts are well filled and covered with natural cotton down-proof cover. The higher the % of down the smoother the feel and more expensive they become. We strongly recommend buying an insert 2″ bigger than the cover , so that the corners will be well filled. They are available in most sizes, and shapes (round, neck rolls, hearts, and rectangles). Unfortunately, due to limited space on the web site, we list only our most popular sizes. If you need anything else e-mail us (contact us) or call 305-634-3415 (9am to 4pm est.). Rectangles, Circles, Bolsters (neck rolls) These are ONLY a few more of the most popular “shapes” of inserts for decorative pillows that we make (in addition to the squares listed above)… If you don’t see it, call us for prices. 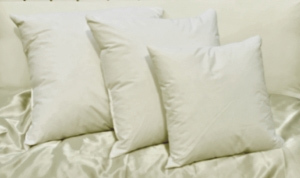 Satin covered inserts are use with eye lid fabrics, embroideries, see-through-covers, for an elegant fine finish, as well as stand alone applications such as decorative baby pillows. We make satin inserts, filled with your choice polyester fiber, in virtually any size/shape to fit your needs… Call for quotes. Listed are the most popular sizes. We manufacture custom inserts in both solid filled, with channels (first picture), or “envelope” style with foam in the center and channeled filled compartments on top and bottom (second picture). 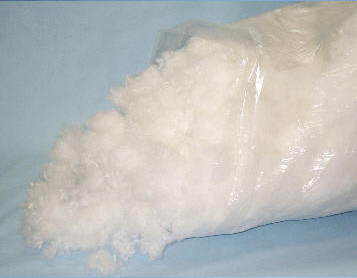 The fill can be your choice of polyester fiber or any down/feather combination including 100% down. These are commonly used for seats and backs in sofas and chairs. Generally, the solid construction is used for back cushions, while the envelope style (with the foam core center) is used for seats.